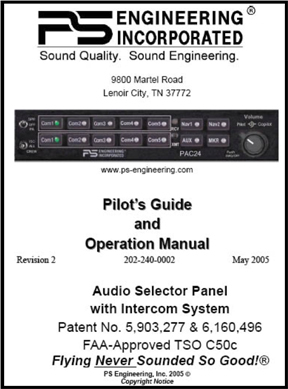 This is the official Pilot\'s Guide for the PAC24 Audio Panel from PS Engineering. It covers the function of each control and some of the more common procedures. 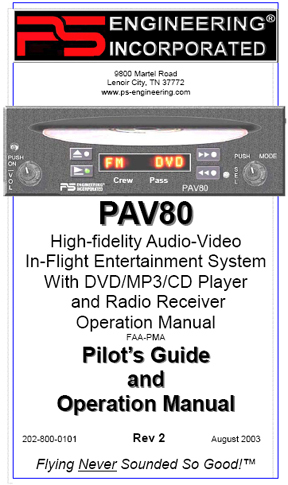 This is the official Pilot\'s Guide for the PAV80 In-flight Entertainment System from PS Engineering. It covers the function of each control and some of the more common procedures. 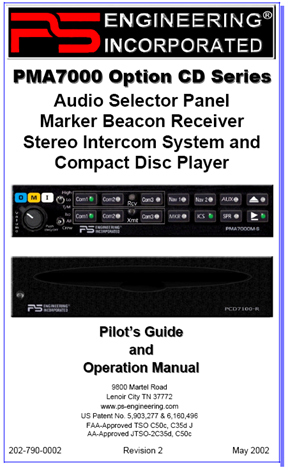 This is the official Pilot\'s Guide for the PCD7100-I Intercom-CD/MP3 player from PS Engineering. It covers the function of each control and some of the more common procedures. 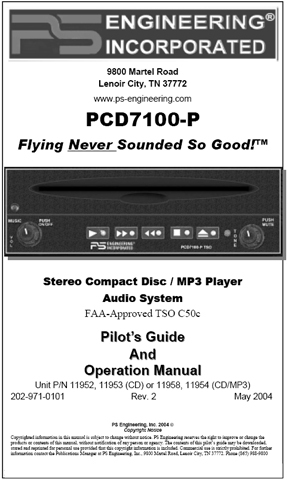 This is the official Pilot\'s Guide for the PCD7100-P Stereo CD/MP3 player from PS Engineering. It covers the function of each control and some of the more common procedures. 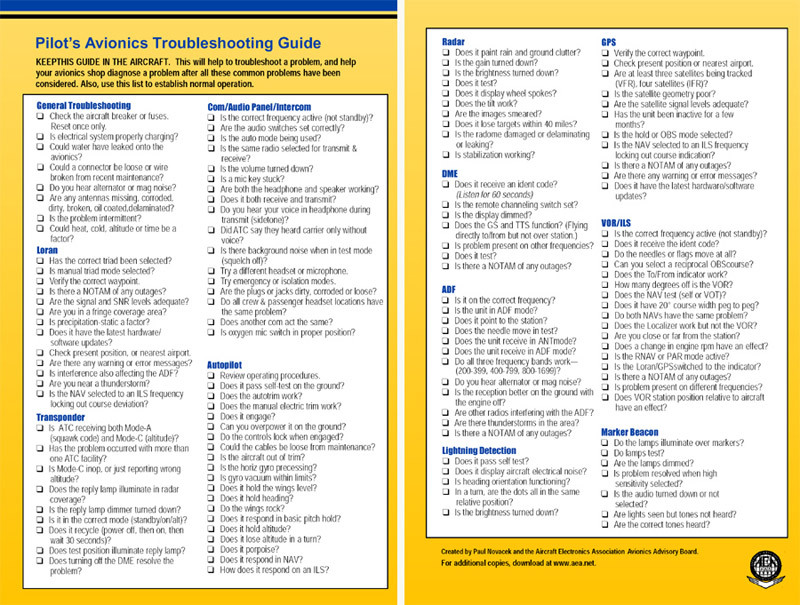 This approach-plate sized troubleshooting guide should be kept in the aircraft to aid in-flight avionics use. 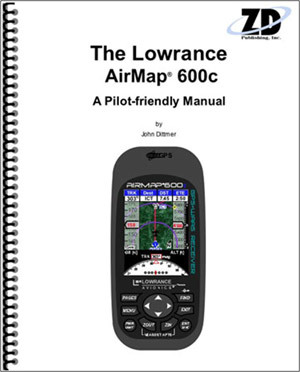 It will guide a pilot through common configuration or programming problems and help the avionics shop with better write-ups. 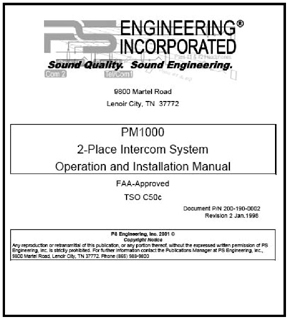 This is the official Pilot\'s Guide for the PM1000 2-place Intercom from PS Engineering. It covers the function of each control and some of the more common procedures. 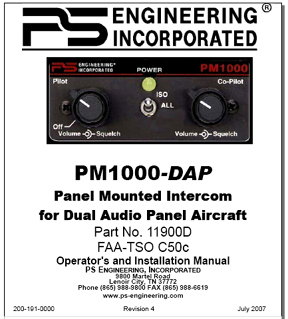 This is the official Pilot\'s Guide for the PS Engineering PM1000-DAP Intercom for dual audio panel installations. 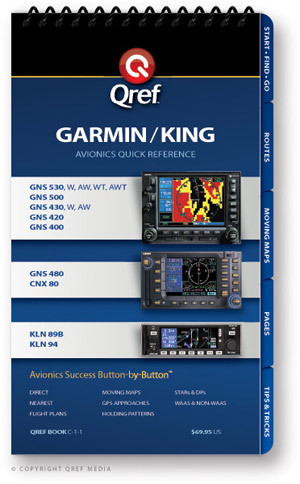 It covers the function of each control and some of the more common procedures. 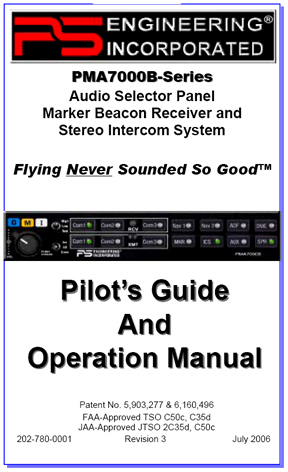 This is the official Pilot\'s Guide for the PM1000II 4-place Intercom from PS Engineering. 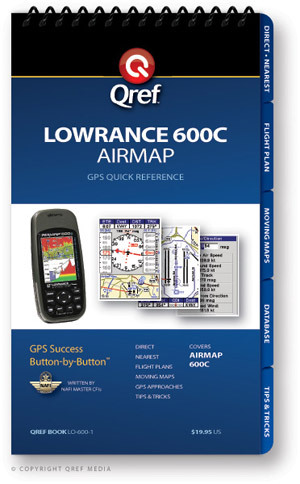 It covers the function of each control and some of the more common procedures. 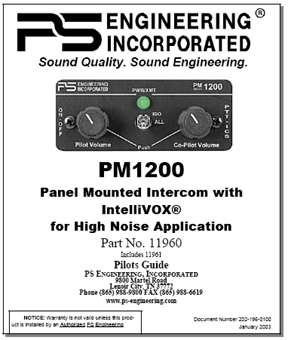 This is the official Pilot\'s Guide for the PM1200 Intercom from PS Engineering. It covers the function of each control and some of the more common procedures. 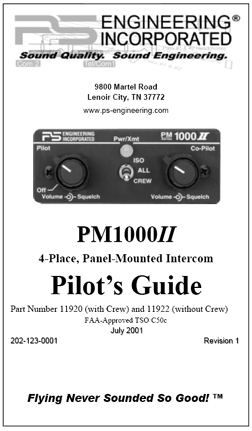 This is the official Pilot\'s Guide for the PM2000 4-place Intercom from PS Engineering. It covers the function of each control and some of the more common procedures. 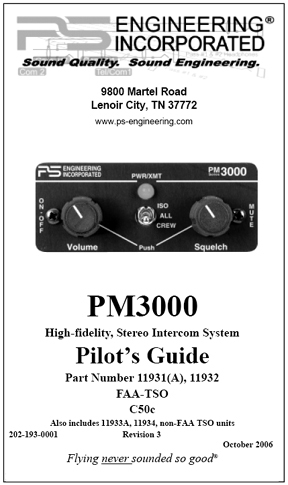 This is the official Pilot\'s Guide for the PM3000 Intercom from PS Engineering. It covers the function of each control and some of the more common procedures. 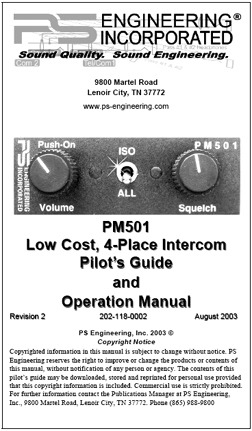 This is the official Pilot\'s Guide for the PM501 4-place Intercom from PS Engineering. It covers the function of each control and some of the more common procedures. 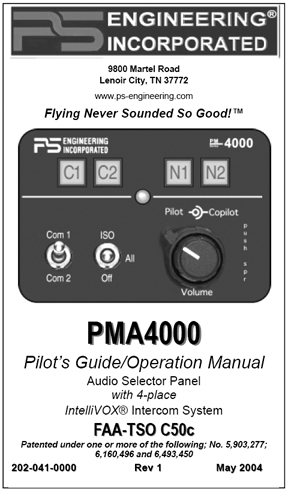 This is the official Pilot\'s Guide for the PMA4000 Audio Panel from PS Engineering. It covers the function of each control and some of the more common procedures. 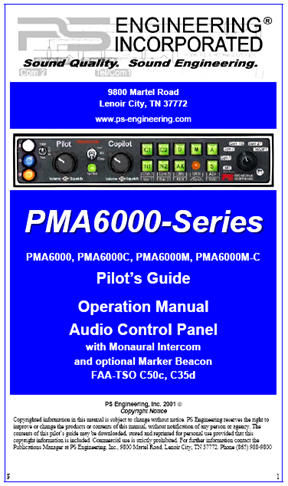 This is the official Pilot\'s Guide for the PMA6000-series Audio Panels from PS Engineering. It covers the function of each control and some of the more common procedures. 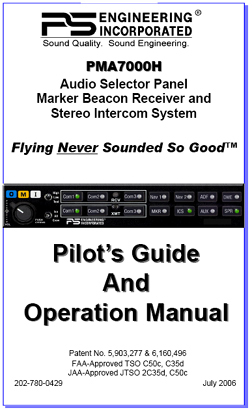 This is the official Pilot\'s Guide for the PMA7000B Audio Panel from PS Engineering. It covers the function of each control and some of the more common procedures. 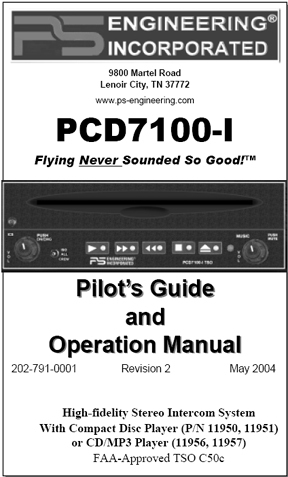 This is the official Pilot\'s Guide for the PMA7000-series Audio Panel/CD player from PS Engineering. It covers the function of each control and some of the more common procedures. 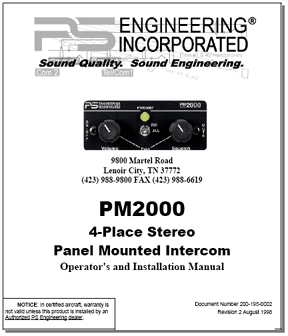 This is the official Pilot\'s Guide for the PMA7000H Audio Panel from PS Engineering. It covers the function of each control and some of the more common procedures. 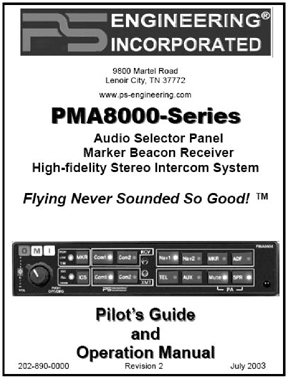 This is the official Pilot\'s Guide for the PMA8000 Audio Panel from PS Engineering. It covers the function of each control and some of the more common procedures.